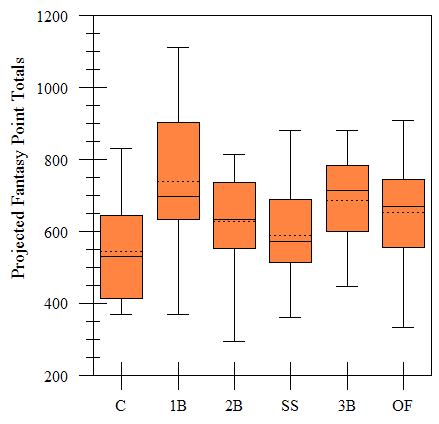 Commenters in my last post asked how to determine position scarcity in FanGraphs Points leagues, and another reader, Kris, suggested using box plots. I figured “hey, that’s a good idea for a post.” So, here is a box plot based on Marcel projected 2011 performances for starters at each hitting position (using the numbers of players per position that Zach used here). If you haven’t seen these graphs before, here’s a good description of how they work. But very briefly: the “box” is the middle 50% of the data, and the whiskers show the range of values outside of the box…unless there are outliers, which are then ignored for the whiskers and plotted as individual points. The black horizontal line inside the box is the median, while the dotted line is the mean. You can get tons of information out of one of these plots. Beyond simply the rank order (which is clear), a quick look at the size of the boxes gives you a good indication of the amount of variation in the bulk of players at a position. You can see that there’s a lot of variation among catchers and first basemen, while there’s less among the shortstops (with two exceptions, mentioned below). You can also get an idea about the shape of the distributions. One thing you see across the board is that the positions all tend to be a bit skewed: there are lots of players close to replacement, with gaps between players getting larger as you move toward higher projected Points per PA. This is particularly dramatic at SS and 3B, where you have a handful of elite players that pull the mean up, despite the fact that the median guy you get at these positions is much lower. At SS, the elite duo of Hanley and Tulo are perched massively above the rest. All of this has implications if you’re trying to come up with a number for a position adjustment. Say, for example, you base it on the mean FP/PA. By that measure, you’d think that 3B is the second-best position, behind only 1B’s. If you use the median, however, you’ll rank them below OF’s as well, and only slightly above the 2B/3B territory. Shortstops rank last by both measures, but the awfulness of SS is much worse by the median compared to mean measures. Catchers are interesting–they rank reasonably well this year compared to 2B/SS. But they play far less than other positions, which gives an extra premium to the guys who actually play 5-6 games per week instead of 3-4. Note that this is based on Marcel PT projections, which are far from perfect and are strictly based on past MLB usage. But you can see that individual catchers projected to score far fewer points than players at other positions, simply because the typical catcher plays in fewer games than other positions. Of course, since ottoneu uses two catchers (with a combined cap of 162 games), this problem is mitigated to at least some degree…as long as you get good performances from your backup catcher (so don’t neglect him!). What else do you see when you look at these graphs? We hoped you liked reading Position Scarcity in FanGraphs Points Leagues by Justin Merry! 3B is way denser and top heavy than a high pick of Longoria would justify based on scarcity. Of course 3PA is the best indicator to see how well a guy played last year, but all leagues are won by the guys that get the most PAs with the highest quality so durability and lineup spot are more important than any other factor – scarcity included. I don’t know what you mean by 3PA. As for most PA’s…it depends on your league. In a H2H league, I think this can be very important. But in an ottoneu league, where games are capped, while I can see lineup spot mattering a bit, I think durability is less important because you can use off days throughout the season to make up for lost games pretty easily.